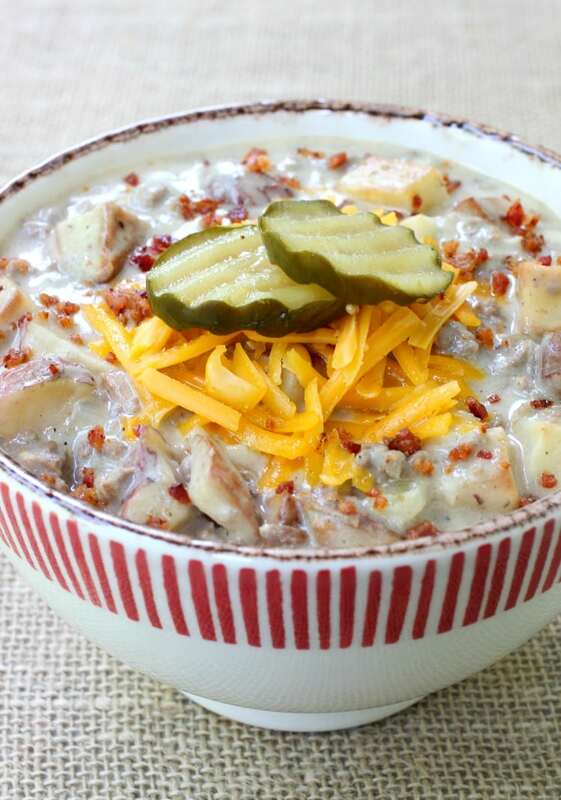 This Cheeseburger and Fries Chowder is so full of beef and potatoes it’s almost like a stew! A stew that tastes like bitting into the best cheeseburger ever. So what sets this chowder apart from all the other cheeseburger soups out there? Well, first of all it’s not a soup, it’s a chowder. Definitely a chowder and like I said, it could almost be a stew. Even if it’s Lobster Chowder – I’m not skimping on the lobster. It’s gonna be loaded up. So the “stuff” in a soup or a chowder is really what I like. And the more there is the better. But what also sets this Cheeseburger and Fries Chowder apart from the other recipes is the way I made the potatoes, I roasted them before I put them in the chowder, just like a oven roasted french fry. For one the potatoes don’t get all mushy that way and for two, roasting them beforehand gives the chowder so much more flavor. And to kick the flavor up even more I coated them with Stubb’s Beef Natural Spice mix. 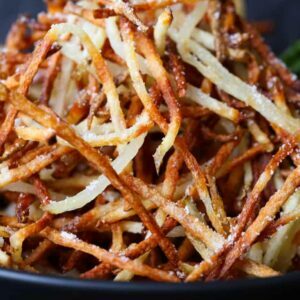 First I was only going to use the Stubb’s Beef Spice only on the beef but then I thought why not give those oven roasted fries some of that flavor too? They turned out pretty darn good – at least half of them actually made it into the chowder! While the potatoes are in the oven you can start the chowder. 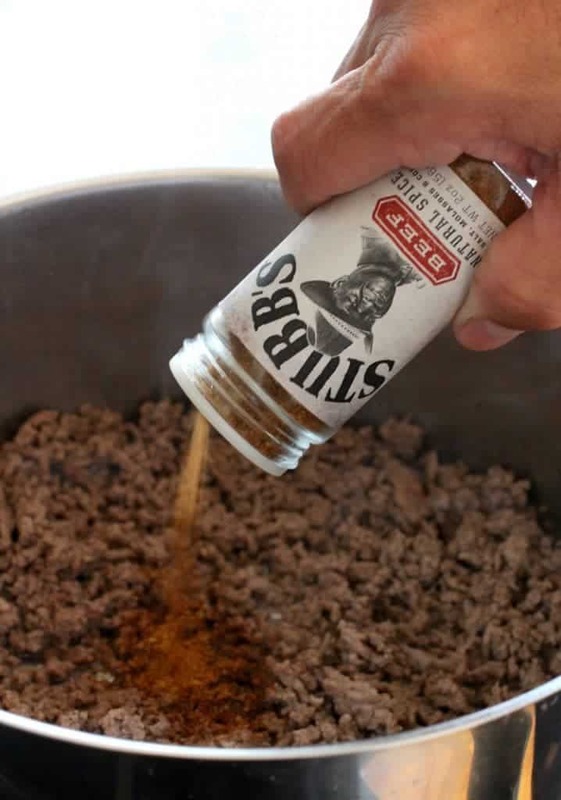 Grab a big pot and brown the beef with salt and pepper and a few big shakes of the Stubb’s Beef seasoning. Once the beef is browned add in onions, celery and garlic and let them cook down for 10 minutes, then toss in flour to thicken the soup. Stir the flour together with the beef and vegetables for a minute, then pour in the milk and chicken broth. Definitely stick with whole mile here – it makes a big difference in the thickness of this chowder. What also helps flavor and thicken this up is the big ol’ scoop of cream cheese you’re going to stir in. I did this with our Beefy Tomato Soup and it turned out to be one of my favorite soups ever. Now it’s time to add those “fries” to the chowder. Like I said, this chowder is packed with beef and potatoes so if you like your chowder to have more broth just cut back on the amount of potatoes. But for me – this is perfect. 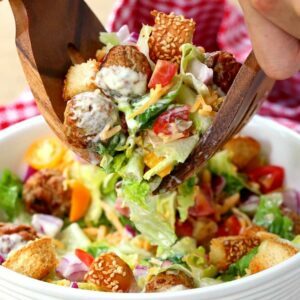 You can stop there, or you can do like we did and add crumbled bacon and cheese on top. The cheese really isn’t optional I guess since this is “cheeseburger” and fries chowder…and the rest of the toppings? Well, I guess it depends on how you like your burger! 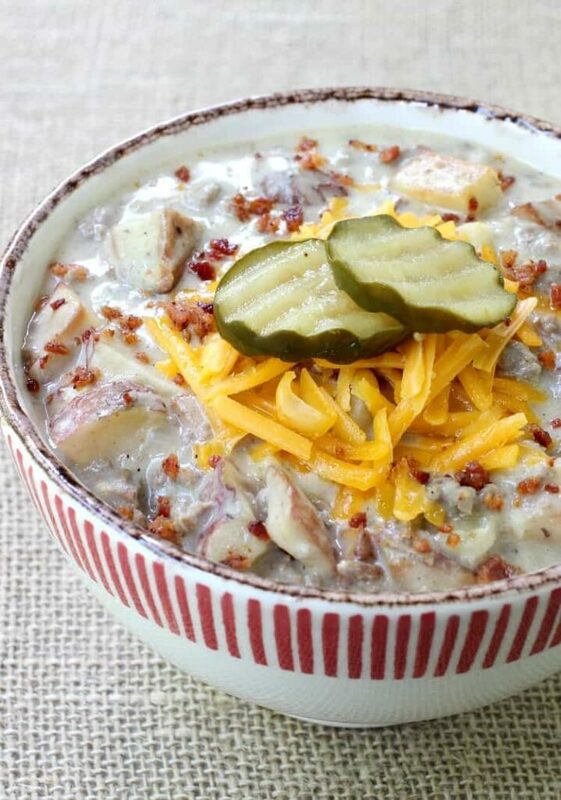 One bite of this chowder and it’ll become a family favorite! 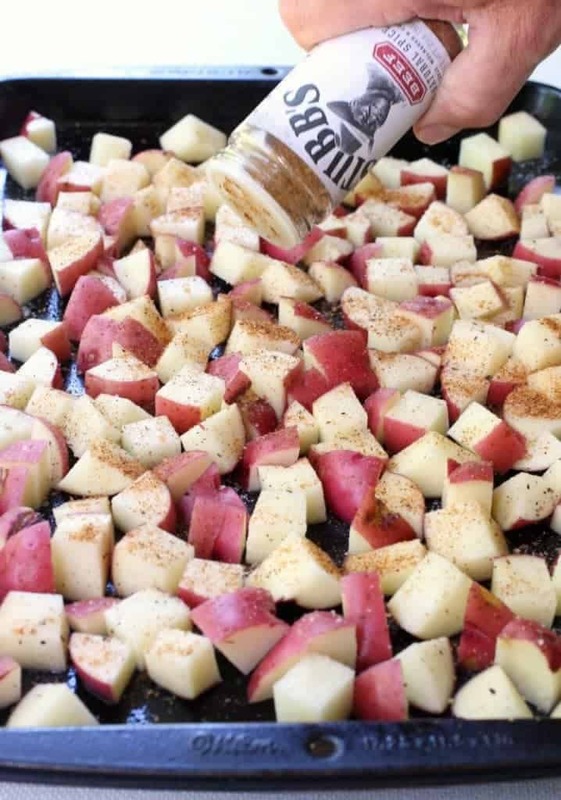 Place the cubed potatoes ontp a baking sheet sprayed with cooking spray and toss with 1 tablespoon of the olive oil and 1 tablespoon of the Stubb’s Beef rub. Roast in the oven for 30 minutes, tossing once halfway through cooking. While the potatoes are roasting, heat up a large soup pot with the other tablespoon of olive oil. Add the beef, the other tablespoon of Stubb’s Beef Spice Rub, onion, celery, garlic, cumin, worcestershire sauce, salt and pepper. Stir and cook for 10 minutes, stirring in between until the onion and celery soften. Sprinkle the flour over the beef mixture, stir and cook for one minute. Pour in the milk slowly, stirring as you pour. Once the milk is in you can pour in the chicken broth, then bring the chowder up to a boil. Reduce the heat and let simmer for 15 minutes until the chowder had thickened. After 15 minutes has passed, stir in the cream cheese using a whisk to get the lumps out. 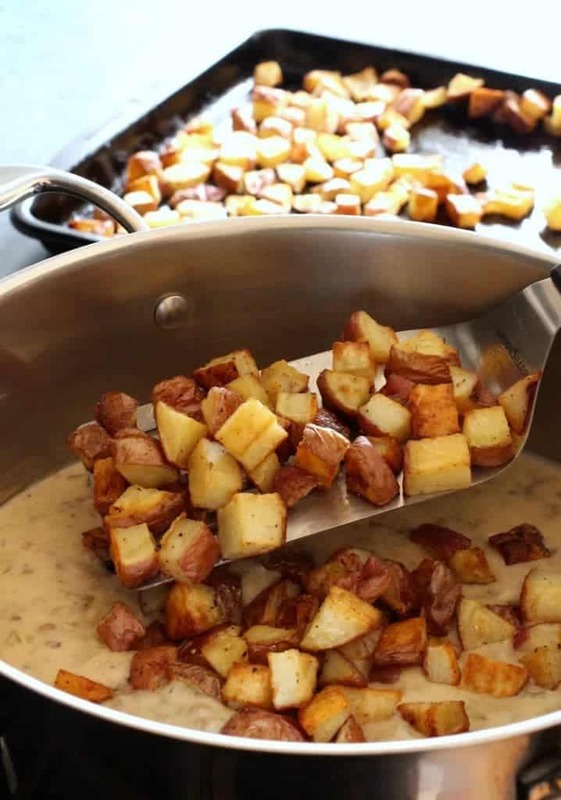 Now you can add the roasted potatoes into the soup, stir and serve. 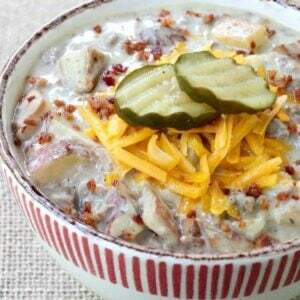 Spoon the chowder into bowls and top with cheese, bacon and pickles. Love the pickles on top! Perfect touch! Thank you Lane & Holly! What a brilliant idea! So hearty! 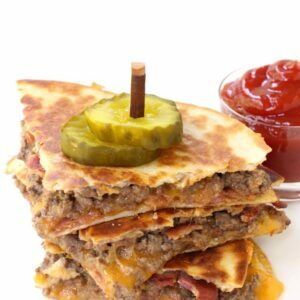 Again, your recipe makes me happy (made your sliders a few weeks back) I am definitely making these during football season instead of chili! Thanks so much Michele! We shared your Summer Kick off Cocktail today, can’t wait to try that one! This is everything I’ve ever wanted in life! Thank you so much – I have to agree!